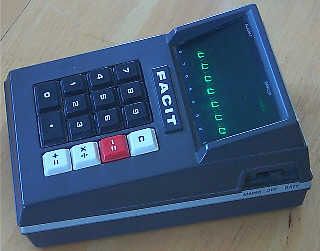 The Facit 1111, other than subtle packaging differences, is an OEM (Original Equipment Manufacturer) version of the Sharp EL-8. The EL-8, introduced in January, 1971, was the first easily portable battery-powered electronic calculator with a truly usable runtime on battery power. Famous Swedish mechanical calculator manufacturer Facit AB, along with it's wholly-owned subsidiary, Addo-X, had an OEM relationship with Sharp Corporation, which provided Facit with rights to purchase the internal electronics from Sharp and package it in their own cabinetry and keycaps, marketing the resulting calculators under the Facit and Addo-X brand-names. The Addo-X machine was designated the model 9364. The exhibited calculator, which was manufactured in January of 1972, was given to me as a birthday gift by my parents (who had to scrimp and scrape to be save the money to purchase this machine from a local business-machine store) on my 14th birthday in late 1972. At a retail price of $345, it was a pretty extravagant birthday gift, but my parents were willing to make such a purchase because I was very interested in math, and this was a way that they could support my interest. I was the only kid in school to have a calculator at that time. The batteries lasted long enough to make it through an entire math class without a recharge! Some kids offered to pay me their lunch money to borrow it to help with their math homework. Some of the teachers at school were quite threatened by me bringing the calculator to school. In those days calculators were thought to be tools only to be used by adults who already knew their basic math skills, and use of a calculator by children would cause them to not learn how to do math themselves. At one point I was told to leave the calculator at home. Fortunately, the attitudes about such things have have changed, such that calculators are an now an important part of the math curriculum in schools, and a very valuable learning tool. 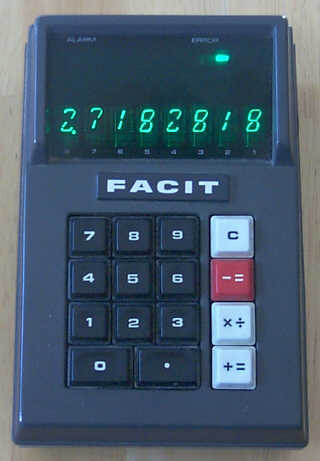 The Facit 1111 is a basic 4 function, 8 digit floating point calculator. It uses individual tube-type vacuum fluorescent displays, with a unique eight-segment pattern, causing the digits to look more hand written. The most unique digit is the 0, which is half-height, and takes some getting used to, but, in lieu of leading zero suppression, does make it easier for the user to ignore insignificant leading zeroes. 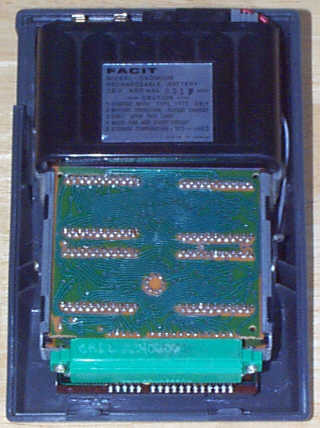 The insides of the Facit 1111 are identical to that of the Sharp EL-8. 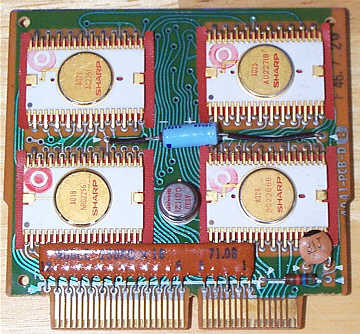 The brain of the calculator utilizes four Metal-Oxide Semiconductur (MOS) Large Scale Integration (LSI) integrated circuits in ceramic 42-pin zig-zag pin layout packages, fabricated by Rockwell for Sharp (though the chips have a SHARP marking), along with a clock generator IC (in TO-5 type package), all mounted on a phenolic, double-sided plug-in printed circuit board, that, for the time, looked like it was a stretch for printed circuit board technology. The board also contains two capacitors (one electrolytic, one ceramic disc), one discrete resistor (56K Ohm), and a hybrid module that contains 16 250K Ohm resistors. The hybrid resistor module has a date code of the 8th week 1971 (71.08, or the last full week in February, 1971), and the circuit board has a date stamp of 46.7.20. The circuit board date code is represented in what is called a Showa date. Showa dates use a form of YY.MM.DD, with YY indicating the year of Japanese Emperor Hirohito's reign over Japan (with year 1 being 1926), MM indicating the month of the year, and DD indicating the day of the month. Therefore, the code indicates year 46 of Emperor Hirohito's Reign (1926+46-1=1971), month of 7 (July), and day of 20. It appears that the date stamp was the date when the assembled circuit board passed its final quality assurance testing/inspection, Tuesday, July 20, 1971. At that point, the circuit board was placed into production inventory for eventual placement in a calculator. It wasn't until nearly six months later, in the case of the exhibited calculator, that the circuit board was used in production to manufacture this calculator sometime in January of 1972. The chips used are the same in function as the chips used in Sharp's breakthrough QT-8D, the first mass-market calculator to utilize MOS/LSI integrated circuit technology, however, improvements were made to the chips used in the Sharp EL-8/Facit 1111/Addo 9364 to cut the power consumption of the chipset by half from those used in the QT-8D, in order to improve the run-time of the calculator on battery power. The earlier Sharp QT-8B was a modification of the QT-8D to add a rechargeable battery pack, and a docking station-style charger. Though the QT-8B was portable and could operate on battery power, it was rather large and a bit heavy for easy portability, especially with the charger dock. Along with that, the battery-powered runtime of the QT-8B was rather short, limiting its effectiveness for field use. The Sharp EL-8 was the result of an intense engineering effort by Sharp to both reduce the size of the calculator, as well as power consumption, by half. The display and display driving circuitry reside on another circuit board that plugs into the edge-connector-based backplane. The keyboard unit also connects into the backplane. The machine uses a rechargable Nickel Cadmium (NiCd) 7.2V battery pack which was easily replaceable. Beneath the battery pack is another circuit board that contains the power supply circuitry that generates the necessary voltages for the display system and the integrated circuits from the power provided by the battery pack. The 1111 has an external AC power supply/charger module that plugs into the calculator for operation from AC power, or for charging the NiCd battery pack. The calculator minimizes real-estate on the keyboard by having a dual-function multiply/divide key. To multiply, you enter the multiplicand, press the [X÷] key, then enter the multiplier, then press the [+=] key for the answer. To divide, the dividend is entered, the [X÷] key depressed, then the divisor is entered, and [-=] key is pressed to perform the division.